Boeing has been incredibly innovative in the last few decades. Their 737 MAX aircraft has changed domestic flying, their 787 has created the concept of long haul low cost (such as Norwegian) and their upcoming 777X is going to redefine what it means to fly in a post jumbo jet world. But there is one area that is still underserved, the medium-haul, high capacity marketplace. Boeing 797 Render. Source: Youtube DJ’s Aviation. What is the middle of the market? As you can see, there is a gap between aircraft that can carry 206 to 242 passengers, a gap between 4000 nm and 7000 nm range and a $110 million USD cost difference. This ‘middle of the market’ is currently underserved. As you can see, it neatly slots into this market and would allow high capacity routes, such as Chicago to New York, or Sydney to Melbourne, to be effectively served. In fact, the first airline to operate one would simply clean up. We have discussed potential new routes for this aircraft in a previous article. The Boeing 797 will feature technology found on both the 787 and the 777X, that will reduce operation costs up to 40%. These savings may be passed onto passengers, allowing airlines to directly compete on price. This will give them a huge advantage over their competitors who are operating heavier and less efficient aircraft. Because the 797 is also smaller and twin-aisled, it means faster boarding and disembarking (as fast as a 737). Additionally, the 797 will cost carriers less to buy. Because the aircraft will be around $120-150 million (estimated), it will allow more budget carriers to enter the market place and disrupt the incumbents. We may see new low-cost routes from smaller cities, such as Boston to Frankfurt, Washington to Florence, or even Quebec City, Canada to Nice, France. These smaller airports have much smaller fees than New York or London and are actually underserved. Customers have less preference to fly via hubs and would prefer to go right to their destination, a growing trend that the 797 is well suited to take advantage of. The 797 could potentially beat out the 787 Dreamliner, which whilst bigger, simply means more tickets to sell. By focusing on smaller routes (with less competition), a low-cost carrier could clean up whilst a 787 requires a higher level of base demand (as well as more fuel to get off the ground). What do you think? Do you think that the 797 will open up new opportunities for low-cost carriers? I want to see a new middle market since 2007, and i believe in the 797. The two sersions have a good capacity. In reality the a321 have a capacity 184 seats in two classes, against 265-290 for the 787-8, with 8 or 9 seats abraist. Why would you need a midrange plane to do ChicagoNYC? What matters more on routes like that is the shuttle-like frequency, which on its own and with the planes used (737 etc…) provides the capacity needed already. For example, let us take Sydney to Melbourne as an example. Currently, there are 80 planes an hour landing at Sydney airport, which is maxed capacity. There is no opportunity to put anymore 737 aircraft on that route. The 797 however being bigger but just as fast to board, will allow an airline to increase capacity without more planes landing. Somehow, the numbers do not make sense to me. Is the estimated cost of a 797 at $120-150 million realistic? It sounds too low and that would make this entire theory invalid. Mmmmmm that unserved medium size and range market seems a lot narrower that previously thought. I know the 787-8 is going to be more expensive to buy than the 797, but would the 787-8 cost about the same or less to operate than the 797? Given it’s not going to be a composite body, would the weight difference and maintainance advantages of the 787-8 equal things out? You have a 14 seat difference between the 787-8 and the proposed 797, that’s it. But the range— ANA operates 787-8s on a number of domestic routes and shorter international routes. You can carry more cargo given you don’t need a full fuel load, and add 14 more Economy Plus seats. Just wondering, I would love to have a choice of flying in a packed aluminum cocoon 737 or 320 with 28” of pitch, or in a twin aisle 797 that has much more room. As an idea Boeing needs to increase the exit doors so two people can walk through without running into each other or the door frame. The 797 will be a composite construction. 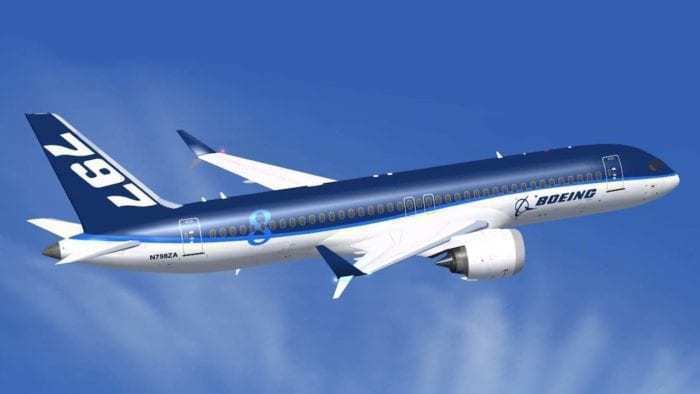 It will have all the new technologies that the 787 and 777X have, and probably a few new ones that have been developed since those programs were introduced. Boeing believes that the routes that these will fly on won’t need the cargo capacity of the 787. The range will be way lower as well, so it will have way smaller engines. It seems like that’s probably true, because Delta has been “Shut up and take our money” on this concept, and other airlines probably are as well. Openings in an aircraft body require substantial reinforcement which equals weight. Larger openings also disturb the seating patterns and density. A wider opening, while likely shortening turnaround speed will cause a weight ans seating penalty. Boston is not a small city. Daily flights to Frankfurth with Lufthansa using 350s and 340s in addition to daily flights to Munich. Boston is indeed a small city, its population is under 1 million. It’s ranked 24th in the US by population. The top 29 most populous cities in the world have a population of over 10 million each. I will never fly in an 787 with 9-seat across in economy. I rather stay home than sitting in a 17 inch seat going 10 hour plus. Boeing has already built this aircraft. It’s called the 757. Back then you has much more legislation so it was never used for transatlantic but these 30year old aircraft are now being used for exactly that. The point of this aircraft would be to fly direct from small to small airports transatlantic and not really for the low cost market. What makes the Boeing 797 so special?? What are its special qualitys?